I’ve had the good fortune to train other digital marketing consultants around the world and I quickly learned that what works in the US, doesn’t play well in South Africa, or Columbia or in Amsterdam. When I talk to my colleagues within WSI operating in other countries I am often surprised how different is the Internet Marketing landscape in Poland and other Central European countries from that present in US, Canada or Great Britain. Of course there are many marketing tactics that work all over the world, but if you want to promote your company successfully (both B2B and B2C) you must be aware of the key differences and aspects that need to be localized. Here I would like to name a few of them. 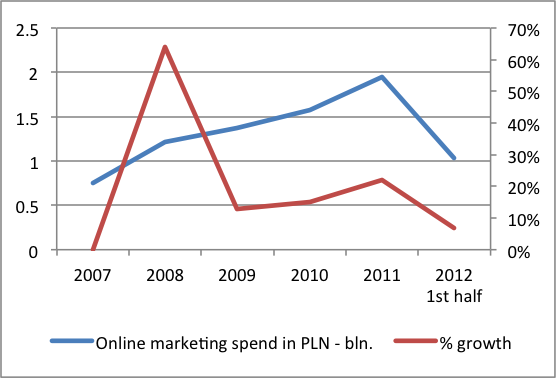 But before that, I would like to share with you a few statistics to present how the Internet Marketing market is growing here in Poland. As you can see on the below graph we observe significant growth rate in budget spent on Internet -it shows you how significant this marketing channel is here. It is in line with the trend that is observed in almost every place in the world: Despite of the crisis, marketing budgets are moved to the online space and are growing. Always remember about cultural and language differences! This is truism but believe me, it happens all the time – companies want to implement the same approach towards every market they target, and you know what? It doesn’t work! Let me give you some example: when I was on one of my first WSI trainings in Toronto (back in 2010) I spotted Old Spice Commercial: The Man your man could smell Like for the first time – this was really great video. But I was shocked when after a year the Brand launched the same campaign in Poland (only text was translated). What do you think was the result? Complete failure – I think only marketers put some attention to the campaign, just to criticize it J Comparing to US or Canada, Poland is a homogeneous society – if you want to attract masses you must show something that is close to them. Moreover, we do not have Caribbean beaches in Poland and oysters are not a part of our day to day menu (at least not of the majority of society). For Old Spice even the translation sounded really weird – without this flow that we all liked in the English version. Ahh, translations. Effective marketing campaign requires great, convincing copy – but it means something totally different in each region. It is not just a matter of good translation; it is about the text that sounds right. In Central and Eastern Europe we are much more allergic on the texts, that are full of marketing incentives, call to actions – we found them too offensive and, as a result, we are repulsed by them. The border is blurred – I know, but you have to be careful with that. Here you can find a link to the polish most popular MEM – we call it forfitter (http://www.youtube.com/watch?v=fFxdDCIAS6c) – this is a video of Polish guy living in US who was feeding a alligator with a chicken. The language he uses is a mixture of polish and English – for us its hilarious J Here you can find other videos that were created after that (songs, covers of movies etc. ): http://www.youtube.com/results?search_query=forfiter . Do you find it funny? Now maybe you know better what I mean by cultural differences? One more thing that I would like to underline is the following: do not rely on automatic tools like Google translate if you are going international, especially outside English speaking world. Majority of those great technologies we use these days started in English speaking world and it really takes time till the quality of other language versions is similar. 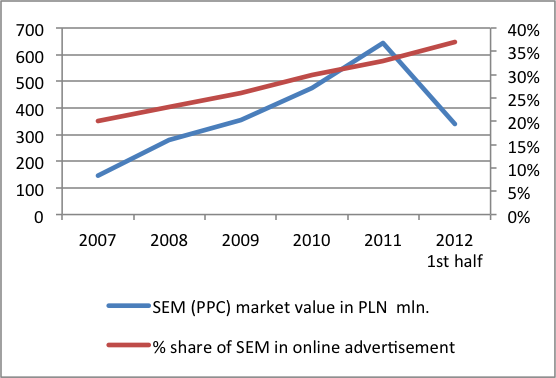 In Poland more than 97% of all searches are done via Google. When we think about SEO or PPC we do not consider anything else here. Looking at the region this is almost always a rule. The exception are Czech Republic with Seznam and Russian speaking countries (Russia, Belarus, Ukraine etc.) with Yandex. The reason for that lies deep down in the past when Google was concentrating on English language and Latin alphabet. In Russia you have Cyrillic, in Czech Republic the Latin alphabet is pretty localized (42 characters) and Google was not doing a good job in presenting the relevant content. To be honest, Google algorithm is here a few generations behind, especially in terms of contextual content analysis. Also the localization of search results is not so strong here as in US. However, I do not want to go much into technical details in this post. From business point of view search engine optimization and pay-per-click campaigns work on the same basis (people looking for answers, products or services land on your website), but the processes and tools used to optimize the Internet presence are a bit different. So you cannot just copy-paste keywords and action plan from your local campaign when you enter the different market. Search Engines are still the fastest growing internet marketing segment. In the below chart you can find a few statistics about that. eBay – this auction platform is almost not existing in Poland, we all use service called Allegro. Few years ago eBay tried to launch his product in Poland, but the market was already covered by Allegro and eBay didn’t find a way to offer a better value proposition. When it comes to social media I must mention that Twitter is almost non-existent here in Poland and it is not because of the platform but due to fact that the whole idea of microblogging is not popular. Of course there are some users who use Twitter, but they are members of few industries like marketing who are early birds in almost any new technology. Take this into account when you plan your social media presence here. I could also name a few more services that are not so popular here: like Foursquare or ITunes. Luckily, like almost the whole world we use Facebook – really heavilyJ (Facebook is one of the most popular services in Poland) – so at least here the principles for marketing in this medium are the same. Maybe you have some comments, questions? I will try to answer the best way I can. Certified Internet Marketing Consultant, part of “We Simplify the Internet” since 2010, running a local office of WSI in Warsaw, Poland. 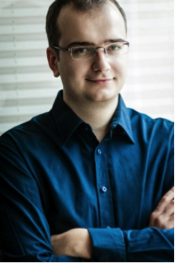 Mateusz works with medium and big companies on development and implementation of their Internet Marketing strategies aimed at Lead Generation and Building Brand Awareness. Mateusz, fan of Web Analytics and conversion optimization specializes in international marketing projects helping companies to expand their international presence.